Movie Review: “The Raid 2” continues the saga of undercover agent Rama (performed once again by Iko Uwais), started three years ago with “The Raid: Redemption”, but without achieving the same surprise effects or impact. Right after the first mission, our hero subjects himself to a few years in prison in order to protect his family. Once there, he deliberately becomes friends with inmate Uco, an unscrupulous, greedy gangster whose father, Bangun, co-rules the city of Jakarta with the Japanese Goto clan. This operation aims to dismantle Jakarta's organized crime and uncover the corruption in his own police force. The interminable physical battles use the same astonishing choreographies to impress our eyes but the action festival becomes somewhat repetitive and consequently tiresome throughout its intense 150 minutes. The plot, written by Welsh director Gareth Evans, didn’t present anything really new apart from the quantity of deadly tools: hammers, different sorts of knives, swords, pickaxes and clubs. The places where the fights occur were also diverse: in the mud of a prison, in the snow of an alley, or even inside cars in movement. Using frequent close-ups to enhance Rama’s determination as well as the severe posture of the other men in face of danger, Evans’s direction wasn’t so brilliant and crushing as in the previous adventure, which takes place inside an old, claustrophobic and labyrinthine apartment building. 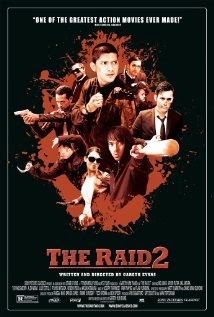 Despite less appealing in conception and over exalted in its scenes of violence, “The Raid 2” provides sufficient energy to please the followers of the genre.